An interesting development in the Cloud Computing world has been the release of the Windows Azure Toolkit for Social Games. The success of companies such as Zynga in social gaming coupled with the predicted growth in revenues generated from social gaming over the next few years has raised the profile of this interesting area of Cloud Computing. To support the potential rapid scaling requirements of successful social games, in a cost effective manner, Cloud Computing lowers the entry point for any organisation or indeed individual(s) who have an idea and wish to implement this. To support this development the Azure Platform as a Service (PaaS) is an environment which enables games developers to focus on the product without having to worry about infrastructure and associated operational requirements. The release of the Azure Toolkit for Social Games further adds to the attraction of Azure as an environment for social games development. So what exactly does the toolkit provide? The Toolkit comprises of three main components. 1. Server API’s comprising a set of services for achievements, virtual goods, leaderboards, user accounts, notifications, virtual currencies. The API’s are JSON REST services and so can be accessed from many different device types. 2. Test Client enabling the testing of the games without the full user experience. Commands can be sent to games as though coming from users for the purpose of test and development. 3. Sample Game is a sample game that demonstrates the use of the toolkit through a game named Tankster. Currently the toolkit is available for .NET and HTML 5 although support for other languages will be available in the future. The release of this toolkit is an interesting development from Microsoft which brings together three growth areas in computing: social networks, distributed gaming and Cloud Computing. It will be interesting to see how this toolkit is utilised and by whom. I often see the word “Agile” associated with cloud computing. That’s a word I know well. I wrote a class on Agile Programming, and I teach XP and SCRUM. I believe I’m Agile in my projects. But what does it really mean? For some, “agile” is just a tactful way of saying “get it done cheaper”! But it’s more than that. When we write “Agile” with a capital “A” it means it abides by the 12 principles of Agile programming. We could summarize those principles by saying; give customers high quality, quickly and for a good value. And when the customer changes their mind, adapt. That all sounds very obvious doesn’t it? If we write “agile” with a lower case “a”, then it means “quick and well-coordinated in movement” (see http://dictionary.reference.com/browse/agile). So, what does “cloud computing” mean? In part, it means rented. We are going to purchase software and/or resources when we need them and for only how long we need them. It also means elastically scalable. As demand fluctuates we easily add or remove resources, paying only for what we need at any moment in time. Cloud computing means fault tolerant; the system is almost always available. For many, cloud computing means online; the system is available from anywhere. It also means resilient; the system can automatically recover from failures. Cloud computing means reduced administration. Someone else is responsible for patches and backups and hardware upgrades. Does cloud computing make IT more Agile (agile)? To determine this, we can analyze the cost, but cost can’t be the only driving factor. To be Agile, cloud services must satisfy users and must provide even greater benefit than traditional software. I moved all my servers to EC2, not because it is cheaper, but because it is better for my company. The fact that it’s also cheaper is a pleasant by-product. Using Windows Azure is not the cheapest way to deploy an ASP.NET application. It can however be the best (most Agile) way. At least if you care about things like scalability, fault-tolerance, security and simplicity. There are many ways to streamline IT using cloud computing services. These services include Office 365, Google Apps, Windows Live, Amazon Web Services, Windows Azure, Salesforce.com, SharePoint Online and many more. You may also like to read these articles that explain more about the different cloud services. 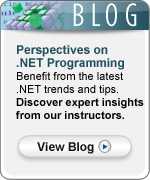 Please visit Learning Tree’s new .NET Programming blog. Isn’t Azure just my ASP.NET Application hosted by Microsoft? Well, yes … sort of … and no. It is true that Microsoft has made it pretty easy for ASP.NET developers to develop Azure applications. It is also generally true that it is relatively straightforward to port most existing ASP.NET applications to Azure with little or no modification. Of course there are some that say the process is still too painful and that additional skills are required. Also, there are others that say Azure requires a new way of thinking about applications and for providing the capability for Internet-class scalability. As usual the reality for most people trying to come to grips with new technology is somewhere between the extremes. Let’s take, for example a simple ASP.NET web application vs. a simple Azure application. The experience for each is similar but different. In particular, let’s look at the support for application security. At the broadest level this means providing for creation of user logins and roles and providing access to resources based on those credentials. How does the Azure application generated out-of-the-box compare with an ASP.NET Web Application? Even though the Azure project wizard creates almost the same starting point as the ASP.NET project wizard there are a few things that are different. In an ASP.NET application the project wizard will do most of the heavy lifting for you. The ASP.NET wizard creates an empty App_Data folder in the project. By default, when the application runs and a login is requested, a SQL Express database file will be created that stores user login information. This SQL Express file can be used in the deployed application or (probably more commonly) could be upsized to a real SQL Server. This is part of the ASP Providers services Microsoft has offered since ASP.NET 2.0. The Azure wizard also creates an empty App_Data folder. However when the Azure application is run no SQL Express database will get created. In fact, the application will throw an exception. So what? What does this mean? Why should you care? While it may be possible to adjust some settings and tweak things a bit to get the Azure application to work with SQL Express like the ASP.NET application does, in practice you would probably never want to do so. Using SQL Express to store application state for an Azure application would be like having training wheels on your Harley! It would seriously limit the scalability of the application and scalability is one of the main benefits of Azure. A better approach would be to use Azure table storage or SQL Azure to persist membership data. Microsoft provides sample code that shows how to do this. The truth is that if you are looking to run a single, simple ASP.NET website, Azure may not be your most cost effective solution. If you are running multiple applications, however, which have non-trivial processing requirements and possibly share membership data, Azure may make sense. Certainly Microsoft has done a good job of extending the .NET namespaces to include first class support for Azure. Additionally the Web Role/Worker Role paradigm offers scalability far beyond what could be achieved with a simple ASP.NET application. To help sort out all of the various details and choices which arise when evaluating architecture options Doug Rehnstrom has authored Course 2602 – Windows® Azure™ Platform Introduction: Programming Cloud-Based Applications. Programmers who attend this course will leave with an appreciation for what Azure has to offer and practical knowledge in how to leverage this platform for their organization’s business interests.